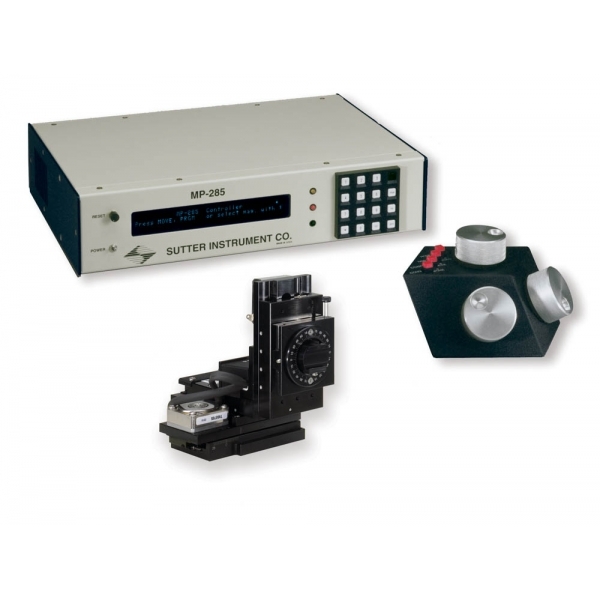 Sutter Instrument motorized MicroManipulator MP-285, has been engineered to provide precise and reproducible positioning, suitable for a wide range of life science applications. Condition: This MP-285 manipulator is used, and in good condition. The instrument was thoroughly tested, cleaned and comes with 90-day warranty. 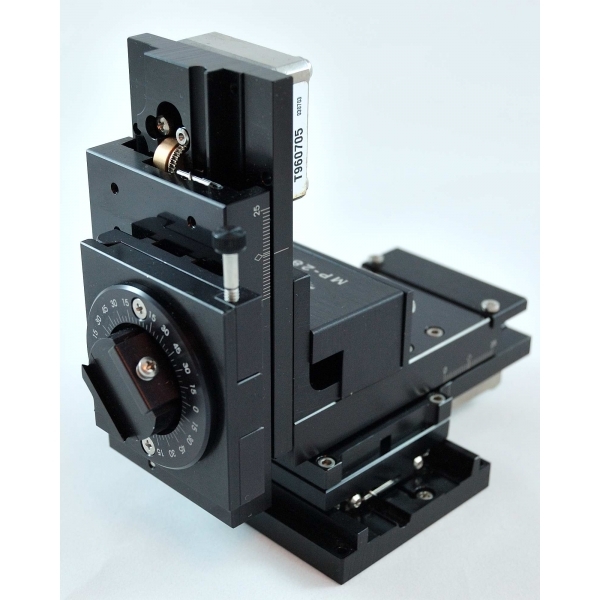 The MP-285 is affordable motorized precision micromanipulator. It offers advanced features found in other manipulators costing thousands more. Custom engineered stepping motors, precision cross-roller bearing slides and proprietary worm gear capstan drives form the basis of the watch-like mechanical system. The controller provides power to the stage motors with a quiet linear power supply to minimize electrical noise radiation in your setup. Pipette holders and headstages can be securely mounted to the MP-285 with one of several unique and rigid mounting systems. The MP-285 was designed to meet a wide variety of positioning needs for the scientific community, and is suitable for patch clamp experiments, extracellular recording, microinjection, intra-cellular recording and precision robotic positioning applications. An outstanding feature of this system is the unique definable 4th axis for diagonal advancement of the pipette. As with the other three axes, you may move with adjustable coarse or ultrafine resolution, select the movement speed, and move continuously or in single step increments. To quickly reposition the pipette, simply select the Home function. Axes positions are continuously shown in relative and absolute scales, and are easily readable on the vacuum fluorescent display. The extremely low backlash of the MP-285 removes traditional drawbacks of “open loop” technology and eliminates drift. This allows submicron resolution down to 0.2 microns in the coarse range and down to 40 nano-meters in the fine range. With over 1 inch of motorized travel on all three axes, and a user designated 4th axis, the MP-285 allows tremendous range of motion while maximizing resolution. For users who require repeatable motion sequences, the MP-285 features easily programmed robotic control from the keypad, or via a remote computer. 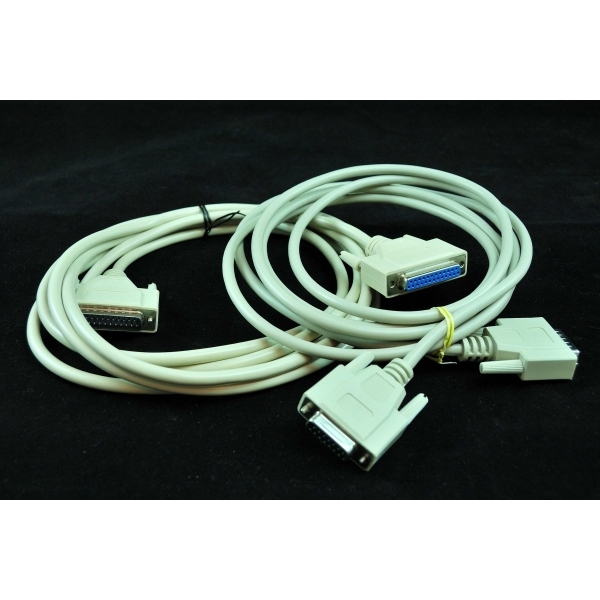 The system can store up to 500 position instructions, including pauses, and will execute the instruction set once, continuously, or in reverse. 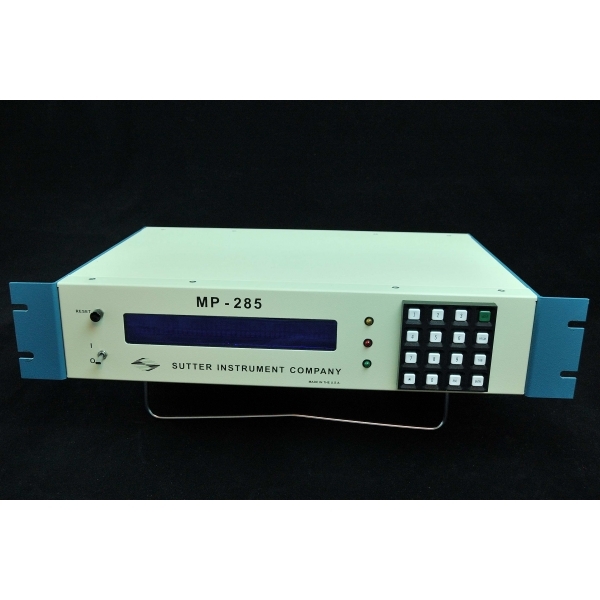 We offer Left & Right MP-285 micromanipulators. 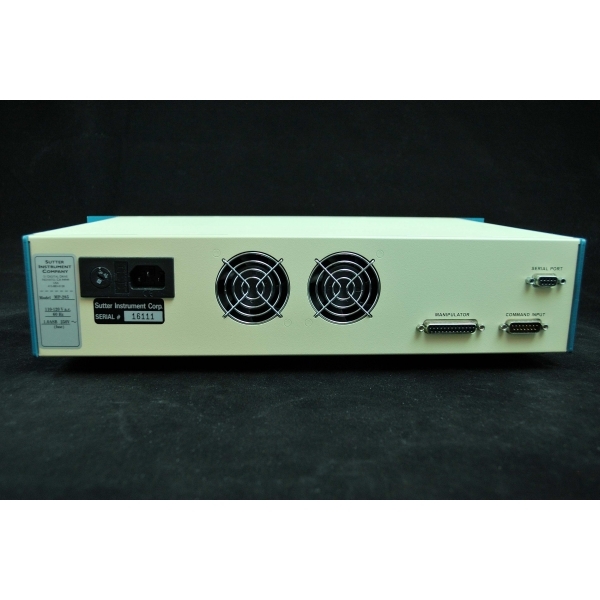 Each MP-285 micromanipulator comes with a separate rack mounted controller and a rotary optical encoder (ROE) manual control unit (see photos). This micromanipulation equipment has been previously used for in vitro electrophysiological experiments. It passed our rigorous testing demonstrating good performance and mechanical stability. MP-285 controller can be programmatically controlled via computer. 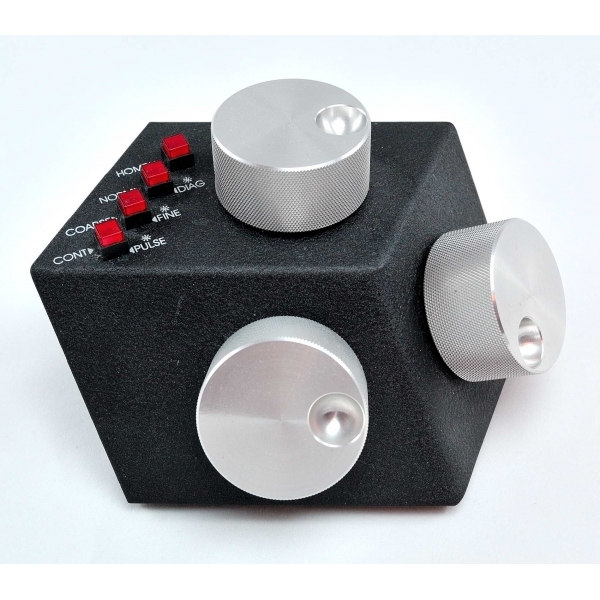 This can be useful for quick and precise positioning of 3 axes micro-manipulator or microscope stage. 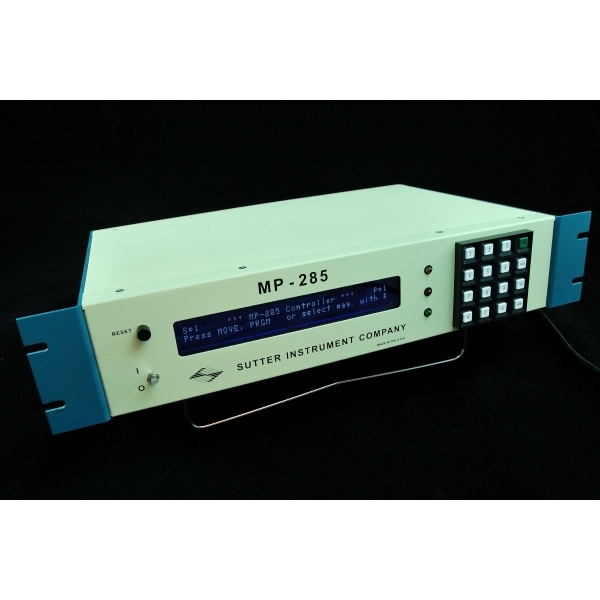 Click here to go to Sutter Instrument website to get stand alone program for use with MP-285 micromanipulator. ScanImage is another independent software application which has an interface control of X, Y & Z position of MP-285 controller. ScanImage was developed for laser scanning microscopy, laser scanning photostimulation, and electrophysiology. Width: Manipulator - 4.0"; Controller - 16.0"
Depth: Manipulator - 6.25"; Controller - 12.25"
Height: Manipulator - 6.0"; Controller - 4.0"